"The Horse Quartet". 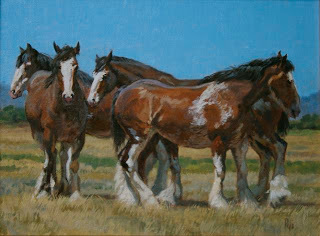 Near Sonoma, California, a rancher keeps Clydesdales. Though they have the run of the ranch, they congregate where the most entertainment possibilities (watching us hurry by), and treat opportunities (suckering us in with our apples in hand), reside, which is right by the highway. This composition is the result of my frequent trips passing by, and was at the Petaluma Arts and Equestrian Festival, yesterday. Polo ponies, barrel racers, and more. There, the horses exulted in doing what they are designed to do: Run like hell while looking as fluid and graceful as ballerinas. The patrons, and the artists, were in awe of the spectacle and the accompanying barbequed chicken. Not many gave a fig about the artwork on display, as the real attraction was in the ring. It reminded me of the old theater adage: Never share the stage with animals, as they always steal the scene. 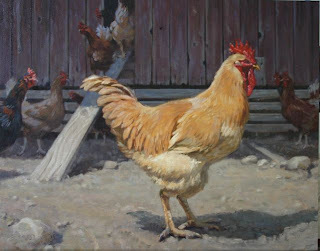 Another chicken painting! Almost a trend, here. Another chicken, another show. The textures of the feathers can be so intriguing.....Greenstring Farms' chickens here in Sonoma County. It's somebody else's chicken house. because I liked the boards better.